I live in Massachusetts, an area barely hit by Hurricane Irene (I never thought I’d hear the words, “Vermont Flattened By Hurricane,” and my heart goes out to people who have really suffered), yet we endured the longest power outage I can remember since the big blizzard of ’78. The outage reminded me that having power in the era of mobile devices is crucial. I’m a work-at-home freelancer who was denied the main thing he needs to do his job: Internet access. Now, most workers need access to email, Instant Messenger, social media and the web. My primary workspace — my house — actually had power, but I was actually working away from home for two weeks at the time of the hurricane. Naturally, the place where I was working lost power for three straight days. A wise man (my editor) once said, “As a freelancer, the ability to work from anywhere is our greatest strength and our greatest weakness.” I was stuck in a bad situation. However, from great adversity comes great good, or at least an article about how to try to work through a power outage in the age of iOS (s aapl) devices. I was naive and hopeful. I never expected we’d actually run out of power. My iPhone was fully charged, but my iPad wasn’t. Most power outages here rarely last more than a few hours, and I thought I had enough juice to get through it. I was wrong. So, as obvious as it sounds, make sure everything is fully charged as soon as you hear word that a storm might be coming. Also, shut down non-essential devices to make sure they stay fully topped off. As a writer who already uses his iPad as a supplemental office, I was all set with apps I can work from. Make sure you have a good text editor and PDF reader to handle your business needs, even if they aren’t as powerful as your desktop tools. In many cases, getting something done slowly, or less-optimally is better than not at all. To stay up to date on the progress of the storm and efforts to restore power, download weather-related apps, and any apps your local news providers might have. In my area, CBS Boston (s cbs) has an iPhone app. Make sure you download and sync them before the storm hits in case one of them exceeds 2o MB. Bookmark your power company’s outage map’s website on your iPhone if they have one. Take their power restoration estimates with a grain of salt, however. And don’t worry; being mad at the houses around the corner for having power when you don’t is a natural, human reaction. When I saw the estimates for how long it was going to take National Grid to get power back, I had to accept a period of lost productivity. My chief goal was keeping my phone charged so I could field calls from my family. Writing and job searching came second. I’m also lucky my lost time didn’t have a major cost associated with it. Everyone’s situation is different, but realize during a major power outage your life is going to be impacted and set realistic expectations. I was prepared to use my iPad as my primary device. I could at least draft articles and queue them up for when normal access to the Internet resumed. My number one concern was being able to get in touch with my mom. I followed Geoffrey’s excellent tips conserving power. I also eliminated Internet tethering to get work done due to the power costs. So the Internet became a beer nursed to last the entire ball game. I’d turn it on to grab emails and give Twitter and RSS a quick scan, marking many items to be read later. It also seemed like AT&T (s t) was straining in my area under the load, thus making tethering a risky choice. My friends give me a hard time about my growing collection of iPhone cables and power adapters, and I’ll be damned if I didn’t use most of them this week. The other day, my truck came in very handy for charging two phones and two iPads. Don’t forget about your vehicle’s ability to charge things with the right adapters. I prioritized my device charging in this order: iPhone, iPad, MacBook Pro. The iPhone came first, for communication reasons I’ve already outlined above. My iPad, with its 10-hour battery life, was my main source for reading, and doing light writing in Pages. My MacBook never got turned on, instead was held in reserve to charge the other two devices in a pinch. Any other tips for dealing with power outages? Share them (along with your Irene-related stories) in the comments. Thanks for the article.It’s really useful for me.Im greatly involved in the process of building apps and find a web service snappii.com a great opportunity to build apps. i-compatible battery extenders also come in handy – a fixed/rechargeable pack, or a unit that allows you to use AA batteries (They come in handy on long plane rides). Solar chargers could work… of course you need it to be sunny!!! But could be used to give you a good charging percentage for the iphone when in need!!! I have 2 car batteries and 2 DC-to-AC inverters. That setup will charge devices and run my amateur radios for weeks. Top off your vehicle’s gas tank so you don’t run out of gas charging your electronics. No need to get a special power adapter for your vehicle. Instead get a dc-to-ac converter (available at any auto parts store) and use your regular charger cables for your phones, iPad, and computer. If you are going to need to run your computer make sure to get one sized large enough for the load. Also, I just bought an external battery for my iPhone because of the drain the GPS puts on it. You can charge these in advance. Mine should be good for about 4 or 5 full charges of the phone before it is elf needs recharging but, since it’s almost all battery, it nots much bigger than an iPhone. I love playing chess on the iPad with my boyfriend. During the power outage we actually broke out the old fashion chess set and went and played chess in the park. Great tips! I’m surprise that these kinds of articles aren’t around more. This is definitely overdue! Would love to know what is the best spare power supply to buy in the case of loss of power for a day or so? 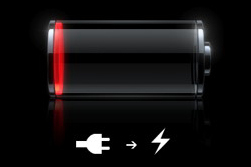 Is there something like a car battery that I could get to charge up the phone & iPad?